Many iPad users opt for web-based or “cloud” storage services that have become extremely popular over the past few years. A cloud storage service such as Dropbox or Google Drive enables you to store and back up your files online, access them from any device, and easily share them with others. There are several excellent cloud services you can use on your iPad, and many offer free accounts. Dropbox is one of the many cloud-based solutions for file storage and sharing. It’s popular because of its features, price, and the fact that it works across devices, platforms, and over the web. Accessing your account on any device: Access your Dropbox account over the web or download the Dropbox app on your iPad for even simpler access. Open the app and sign into your account. 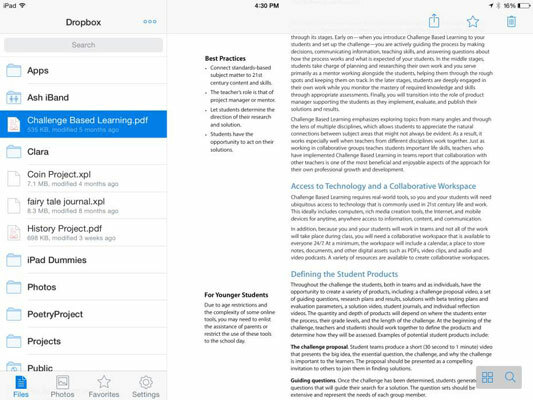 Your Dropbox files will be available and you’ll be able to add content from other apps on your iPad. Saving to your Dropbox account: Most iPad apps have a Share option that enables you to open the content in another app. Tap the Share icon in any app and use the Open In function, selecting Dropbox as the destination app. The Dropbox app opens and the content is filed in your Dropbox account. Distributing information: Pushing information out to students is a piece of cake. Select the folder or file you want to share, tap the Share icon, and select Copy Link. Distribute the link to students or anyone else to whom you’d like to grant access. The other person doesn’t even need a Dropbox account. Submitting work: There are definitely more efficient ways to collect work from students. However, if you’re in a pinch, students can submit their work without having an account as long as they have access to email. What’s the secret? Sign up and it creates an email address for your Dropbox account. Anyone can email content to that email address, and it’s automatically filed in your Dropbox. Dropbox is designed to be a wonderful solution for personal file storage and access. You can also use the sharing option as a simple and effective method for pushing out information to students. However, Dropbox doesn’t have any administrative options for setting up and maintaining different accounts and folders for students. It’s not a good idea to create and use a single classroom Dropbox account on every student iPad, as that gives each student the ability to accidentally move and delete anyone’s folders and files. If you’re in the United States and want your students to sign up and use any web account or service, the Children’s Online Privacy Protection Act (COPPA) requires that they either need to be at least 13 years old or that they have permission from a parent or guardian. You definitely should have a Responsible Use Policy signed by the children and their parents and that you include a section that explicitly grants permission to sign up for web accounts that are intended strictly for educational purposes.